After the fall of the Netherlands to German forces in 1940, the United States obtained military basing rights to the airport from the Netherlands government-in-exile in London. Suriname was then the world's principal source of bauxite (for aluminium production) and needed protection. The first American armed forces arrived at the airport ON 30 November 1941 and expanded the facilities to be a transport base for sending Lend-Lease supplies to England via air routes across the South Atlantic Ocean. The runways were constructed by the US Corps of Engineers. They also built the road from Onverwacht to Zanderij which was completed in 1942. 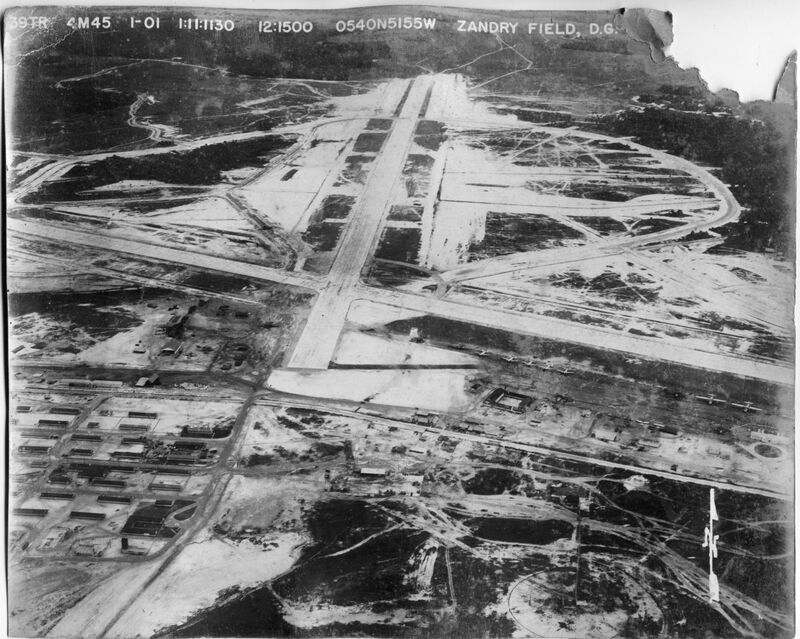 With the United States entry into the war in December 1941, the importance of Zandery Field increased drastically, becoming a major transport base on the South Atlantic route of Air Transport Command ferrying supplies and personnel to Freetown Airport, Sierra Leoneand onwards to the European and African theaters of the war. In addition, antisubmarine patrols were flown from the airfield over the southern Caribbean and South Atlantic coastlines. Just before the Pearl Harbor Attack, on 3 December, the 99th Squadron was ordered to distant Zandery Field, Dutch Guiana (by way of Piarco Field, Trinidad) under an agreement with the Netherlands government-in-exile, by which the United States occupied the colony to protect bauxite mines. However, to the disappointment of the crews, the squadron had to leave its B-17 behind. It was, however, reinforced with additional B-18A Bolo's, bringing squadron strength up to six aircraft. On 2 October 1942, a B-18A, piloted by Captain Howard Burhanna Jr. of the 99th Bomb Squadron, depth charged and sank the German submarine U-512 north of Cayenne, French Guiana. 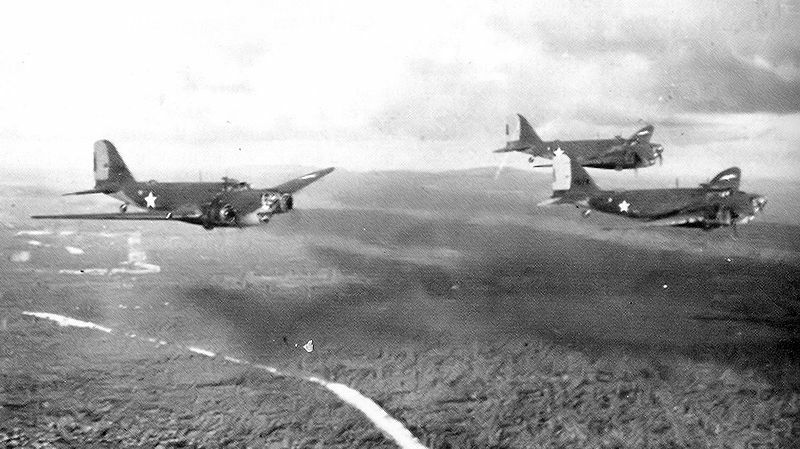 above, B18 from 99th Bombardment Group are seen over Dutch Guyana on a routine patrol mission. At Zandery, the unit shuttled from Zandery to Atkinson Field, British Guiana and, by January 1942, had eight Curtiss P-40C Warhawksassigned. The P-40s were, in actuality detached for airfield defense by the Trinidad Base Command, under which the 99th fell at the time. Operations from Zandery Field consisted of coastal, convoy and anti-submarine patrols until 31 October 1942. Just prior to which time the 4th Antisubmarine Squadron was attached to the Squadron between 9 and 16 October. At this point Antisubmarine Command took over the mission of the 99th and the men and aircraft of the squadron were reassigned. In the middle of World War II, on 2 November 1943, Her Royal Highness Princess Juliana visited Suriname from Canada. She landed at Zanderij with KLM airplane Lockheed Model 14 Super Electra PJ-AIM Meeuw as the first ever member of the Dutch Royal Family. After the landing of the Meeuw and escorting Dutch and US military planes, the Royal Princess was welcomed by governor Kielstra and inspected the guard of honour.